Paramahansa Yogananda’s personal instructions on how to practice the science of Kriya Yoga meditation, taken from the classes he gave for more than thirty years, are presented in detail in the Self-Realization Fellowship Lessons. In addition, the Lessons provide his practical guidance and techniques for attaining balanced physical, mental, and spiritual well-being — the health, healing, success, and harmony that yoga bestows in every aspect of life. These "how-to-live" principles are an absolutely essential component of any truly successful meditation practice. 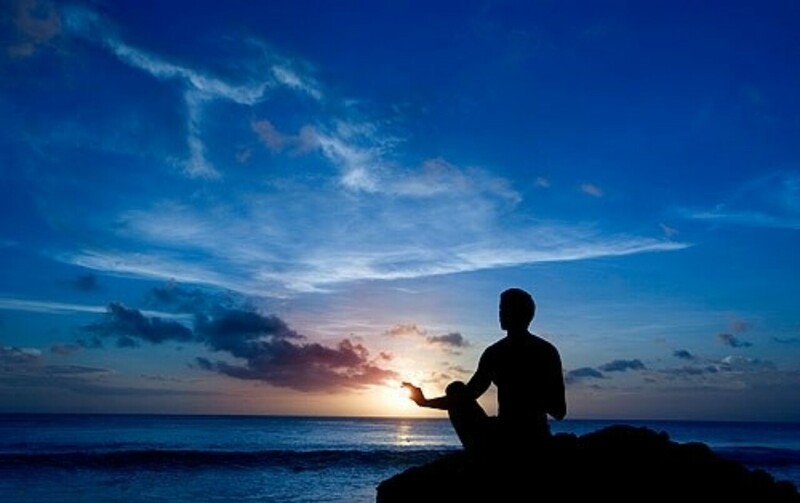 If you have not yet enrolled for the Lessons, you will find on these pages some basic instructions on how to meditate, which you can use right away to begin experiencing the peace and communion with the Divine that meditation brings. Learn the basic steps of a Beginner’s Meditation as taught by Paramahansa Yogananda. Relax all the body parts at once and, as you do so, expel the breath through the mouth in a double exhalation, "huh, huhhh." With the eyelids half closed (or completely closed, if this is more comfortable to you), look upward, focusing the gaze and the attention as though looking out through a point between the eyebrows. (A person deep in concentration often "knits" his brows at this spot.) Do not cross the eyes or strain them; the upward gaze comes naturally when one is relaxed and calmly concentrated. What is important is fixing the whole attention at the point between the eyebrows. This is the Christ Consciousness center, the seat of the single eye spoken of by Jesus: "The light of the body is the eye: if therefore thine eye be single, thy whole body shall be full of light" (Matthew 6:22). It takes deep concentration and calmness to behold the spiritual eye: a golden halo surrounding a circle of blue, in the center of which palpitates a five-pointed white star. Those who do see the spiritual eye should strive to penetrate it by deeper concentration and by devoted prayer to God. The depth of calmness and concentration necessary for this are naturally developed through steady practice of the scientific Self-Realization Fellowship techniques of concentration and meditation [which are taught in the Self-Realization Fellowship Lessons]. A good practice is to take an affirmation or a prayer from the Self-Realization Fellowship Lessons, or from Paramahansa Yogananda's Whispers from Eternity or Metaphysical Meditations, and spiritualize it with your own devotional yearning. 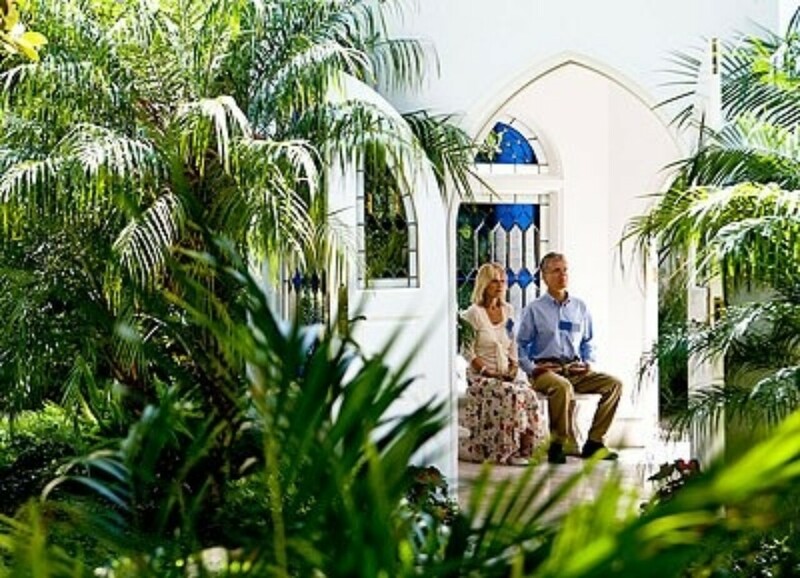 Through daily practice of the foregoing instructions, you can prepare yourself for the practice of the deeper techniques of concentration and meditation that are given in the Self-Realization Fellowship Lessons. These scientific techniques will enable you to dive ever more deeply in the great ocean of God's presence. We all exist at this very moment in that ocean of Spirit; but only by steadfast, devoted, scientific meditation may we consciously perceive that we are individualized soul waves on the vast ocean of God's bliss. "As a first step toward entering the kingdom of God, the devotee should sit still in the correct meditation posture, with erect spine, and tense and relax the body — for by relaxation the consciousness is released from the muscles. "The yogi begins with proper deep breathing, inhaling and tensing the whole body, exhaling and relaxing, several times. With each exhalation all muscular tension and motion should be cast away, until a state of bodily stillness is attained. "Then, by concentration techniques, restless motion is removed from the mind. In perfect stillness of body and mind, the yogi enjoys the ineffable peace of the presence of the soul. "In the body, life is templed; in the mind, light is templed; in the soul, peace is templed. The deeper one goes into the soul the more that peace is felt; that is superconsciousness. "When by deeper meditation the devotee expands that awareness of peace and feels his consciousness spreading with it over the universe, that all beings and all creation are swallowed up in that peace, then he is entering into Cosmic Consciousness. He feels that peace everywhere — in the flowers, in every human being, in the atmosphere. He beholds the earth and all worlds floating like bubbles in that ocean of peace." "As the parlor awakens social consciousness, the library fosters reading consciousness, and the bedroom suggest sleeping, so everyone should have a room or screened off corner, or a well ventilated closet, used exclusively for the purpose of silent meditation. Traditional homes in India always have such a shrine for daily worship. "A sanctuary in one's home is very effective in fostering spirituality, because unlike a place of public worship it becomes personalized, and also because it is accessible for spontaneous devotional expressions throughout the day. The children in India are not forced to frequent the shrine, but are inspired to do so by the parents' example. "In these home temples, families learn to find the soul peace hidden behind the veil of silence. Here they introspect, and in prayer and meditation recharge themselves with the inner power of the soul, and in divine communion attune themselves to discriminative wisdom by which they may govern their lives according to the dictates of conscience and right judgment. "Interiorized prayer brings forth the realization that peace and service to divine ideals are the goal of life, without which no amount of material acquisition can assure happiness." “If the beginner yogi sits on the hard floor to meditate he will find his legs going to sleep, owing to pressure on his flesh and arteries. If he sits on a blanket over a spring pad or mattress, on the floor, or over a hard bed, he will not experience discomfort in his legs. A Westerner, used to sitting on chairs with his thighs at a right angle to his torso, will find it more comfortable to meditate on a chair with a woolen blanket and silk cloth under him, extending under his feet which rest on the floor. Those Western yogis, especially youths, who can squat on the floor like Orientals, will find their knees pliable, owing to their ability to fold their legs in an acute angle. Such yogis may meditate in the lotus posture, or in the more simple cross-legged position. “No one should try to meditate in the lotus posture unless he is at ease in that position. To meditate in a strained posture keeps the mind on the discomfort of the body. Meditation should ordinarily be practiced in a sitting position. Obviously, in a standing posture (unless one is advanced) he may fall down when the mind becomes interiorized. Neither should the yogi meditate lying down, for he might resort to the ‘practiced’ state of slumber.